Informal child care provided by friends, families and neighbors has long been the most common arrangement for families with young children. But in New York City, families receiving subsidized child care are increasingly turning to licensed family child care programs over such less formal arrangements. 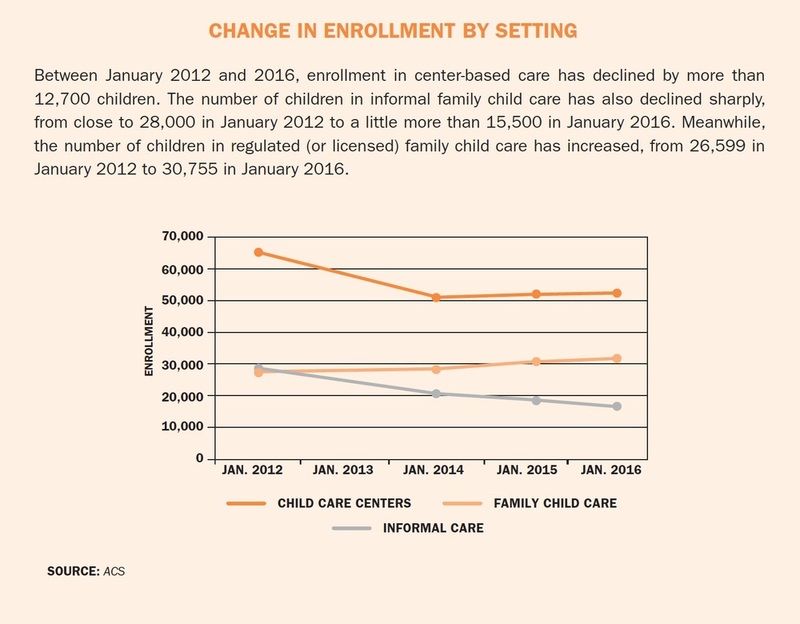 Between January 2012 and January 2016, enrollment in informal care dropped by 44 percent—from 27,708 to 15,668 children, according to data provided by the Administration for Children’s Services (ACS). Meanwhile, enrollment in licensed family child care climbed from 26,599 to 30,775—an increase of close to 14 percent. Many children in the licensed programs are enrolled in group family child care programs, where a licensed home-based provider works alongside an assistant and which often resemble classrooms more than homes. Some attribute these changes to increased awareness of the importance of early education, with many believing that licensed programs—and especially early education centers—are better equipped to prepare children for formal schooling. “It’s a trend over the last four years,” says Nancy Kolben, executive director of the child care resource and referral organization the Center for Children’s Initiatives (CCI). Staff members at CCI say that in recent years they have fielded a growing number of calls from parents with young children who are seeking center-based care. Since many centers aren’t equipped to take babies and toddlers, most of these parents must turn to family child care instead. When they do, they increasingly opt for the more regulated and structured licensed family child care programs, where training of staff is required and which are also subject to more state oversight. They also increasingly choose the group family child care programs, which can take in more children. In subsidized arrangements, the lone family child care provider is becoming less prominent. Between fiscal years 2013 and 2015, their numbers have fallen from 1,479 to 1,090, according to the Office of Children and Family Services (OCFS) data—a decrease of more than 26 percent (See graph “Change in Number and Type of Subsidized Family Child Care Provider,” p. 25) Meanwhile, CCI has identified group family child care programs as a fast-growing pocket of child care capacity for young children. “People are basically operating small centers on the ground floor of brownstones,” says Kolben, about these programs. Like classrooms in child care centers, these group programs frequently have an intentionally educational feel. They sometimes label windows and doors in English or Spanish, and have cubbies where children hang their coats and stuff their blankets. Today, more than 80 percent of the children in the city’s contracted EarlyLearn family child care program are in group-based family child care, according to data from ACS. In many of these programs, the licensed provider will sometimes attend to paperwork while the assistants, among whom there is often high turnover, tend to the children. Among families paying for child care with vouchers, more than 90 percent of children in family child care are in group-based programs. In the years to come, even informal child care is likely to feel the push toward early education. That’s because the recently reauthorized federal Child Care and Development Block Grant (CCDBG) Act of 2014 will likely be bringing increased oversight to the city’s informal arrangements. Renewed for the first time in nearly two decades, this law stresses the importance of child care not only as a support for working parents, but also for its role in early childhood development and school preparation. To that end, it requires states to provide far more attention and oversight to informal programs receiving subsidies than most previously did.